Mercedes-Benz R-Class PDF Workshop and Repair manuals, Wiring Diagrams, Parts Catalogue, Fault codes free download! Mercedes-Benz R-class – a series of minivans of the premium segment, presented by the German concern Daimler AG in June 2005. For the first time it was presented as a concept Vision GST (Grand Sports Tourer) in 2002 at the Detroit Motor Show. The pre-production version was shown in 2005 at the Frankfurt and New York motor shows. The R-Class represents the first full-size multi-purpose car ever produced by Mercedes-Benz. The bodywork of the series is considered a synthesis of a minivan, estate and SUV. R-class is positioned by the concern-manufacturer as a sportswoman. The car is offered in several versions of the wheelbase (classic and lengthened). 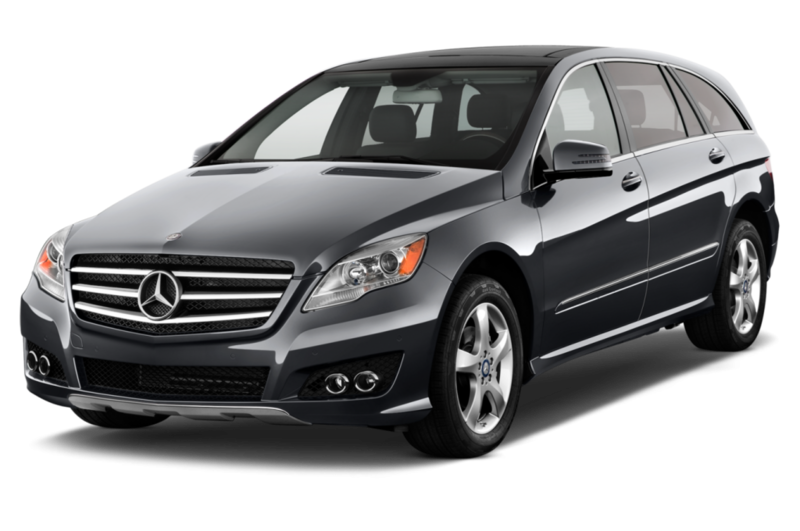 The R-class is built on the W251 platform, and until 2015 was assembled at a plant in Tuscaloosa, Alabama (USA), after which the production was transferred to the AM General plant in Indiana. In the Mercedes-Benz brand class hierarchy, the car is located between the M-class and the GL-class. In the 2011 model year, the R-Class was seriously updated. In 2013, car sales are stopped in all countries, except China, where the car remains a small but steady demand. Currently, only a long-wheelbase version with four-wheel drive and six-cylinder motors (R 320 and R 400) is produced. The pre-production version of the first generation R-Class was introduced in 2005 at the Frankfurt and New York motor shows. Production and delivery to customers began in the same year. The technical base of the series is borrowed from the M-class. As standard, the series is equipped with a fuel tank with a volume of 80 liters. short wheelbase (W251): total length 4922 mm, wheelbase 2980 mm. By standard, the car was equipped with six seats (4 + 2 seats). When the rear seats are folded, the volume of useful space is equal to 2001 liters (short-wheel version) or 2436 liters (long-wheelbase modification). Since April 2007, the option of seats 5 + 2 (five in a row and two as an option) has become available. In May 2007, Mercedes-Benz announced the update of the first-generation R-class. In addition to the all-wheel drive variant appeared rear-wheel drive. In addition, more flexible seating variations (5, 6 or 7 local versions) were proposed to meet the different needs of the company’s customers. The lineup was replenished with a three-liter V6 petrol (231 hp) and diesel engines (R280 and R280 CDI, respectively). The body of the Mercedes-Benz R-Class has acquired small aerodynamic elements in the front and rear, round fog lamps and 18-inch alloy wheels for versions with the V6 engine. The top version of the R500 4MATIC is equipped with 19-inch disks. The AMG package was installed on order. Expanded by three new options, the color scheme of the body: white (calcite white), beige (sanidine beige) and green (periclase green). In 2006, the North American International Auto Show presented a high-performance modification of the R63 AMG. The rear-drive model was equipped with a V8 engine M156 with a working volume of 6.2 liters, producing a capacity of 510 hp. and 630 N · m of torque . The high-performance model uses a 7-speed automatic transmission 7G-Tronic, which is installed as standard. To control the transmission appeared paddle shift petals. The maximum speed of the R63 AMG was limited to electronics at 250 km / h. Acceleration from 0 to 100 km / h took 5.1 seconds. The car was sold only for special orders, but due to low sales in 2007 it was discontinued. In 2009, the R-class was enlarged with models with diesel engines equipped with BlueTEC technology with the BlueEFFICIENCY package. 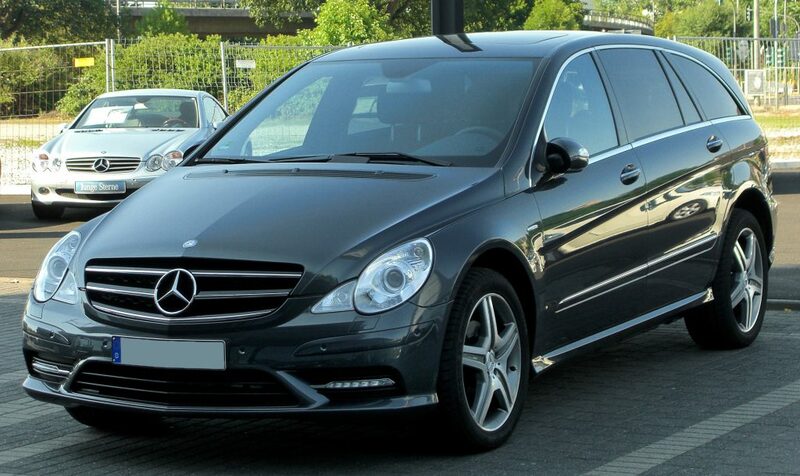 In 2010, the largest in Europe online car market AutoScout24, which offers about 1.8 million vehicles, called the R-class the most popular in the category of minivans. Sales did not coincide with the expectations of the manufacturer, were much lower than the planned 50,000 cars per year. In 2007, only 13,031 units of the series were sold in the world. In the spring of 2010, an updated Mercedes-Benz R-class was presented at the international motor show in Geneva, the model year of which was announced as 2011. The car received a new front end, decorated in the style of the modern model range of Mercedes-Benz. In the front part of the body, new headlights (no longer oval shape), a more vertically arranged grille and a less angular bonnet were installed. The lower panel was also revised and borrowed from the cars of the E and GL classes. The rear optics became LED, the rear bumper changed. In the interior of the series there were minimal changes. Added a lot of new color combinations of salon decoration, including almond beige in combination with brown mocha and alpaca paired with basalt. The new AMG-style sports interior was offered to order, which includes distinctive seats, a better steering wheel with shift paddles, a new lighting package and stainless steel pedals. The basic gearbox for all versions of the minivan was the 7-speed automatic transmission 7G-Tronic with the possibility of manual gear changes. The only available seating formula of the salon is “2 + 3 + 2”. On the rear axle of the car, air suspension pads were installed, and the air suspension of all AIRMATIC wheels was offered by the manufacturer as an option. As an additional security system, Blind Spot Assist and the NECK-PRO crash-active head restraints are available. Some of the power units were also modernized. For the 2011 model year in Europe, three petrol engines became available (V6, 3 liters, 231 hp, V6, 3.5 liters, 272 hp, V8, 5.5 liters, 388 hp) and two diesel (V6, 3 liters, turbo, 265 hp, V6, 3 liters, BlueTEC, 211 hp). In 2012, due to low sales volumes, the top model R550 was discontinued. In the middle of the same year, the R-class was removed from the US market, and in mid-October from all other markets. Nevertheless, in connection with the continued demand for cars in China, the R-class continues to be produced exclusively in the version with a long wheelbase (models R 320 4MATIC and R 400 4MATIC).